As mentioned in Step 1 (see July 12, 2016 update), construction work in rivers is most often done in the dry. So once various cofferdams are completed, the water is removed from within this isolated area. And then, a biologist comes on-site to complete a salvage of aquatic fauna. This work took place over a two-week period. The same monitoring procedures from Step 1 remain in place. Principally, the monitoring of water clarity upstream, downstream and in the work area and the maintenance and adjustment of sediment and erosion control measures and equipment. The water is removed from the isolated area either passively or actively. An example of the passive removal is to allow the water to travel through the original powerhouse into the tailrace. To help maintain water clarity, a turbidity curtain was installed below the tailrace (Photo 1). This curtain was installed with the use of divers to help ensure a good seal on the bottom of the river. For active dewatering, pumps are used. Until the salvage takes place and is completed, their intakes are covered with clean rock to prevent harming aquatic life. The water is then pumped out till the area is dry or nearly so. This is sometimes done one section at a time. 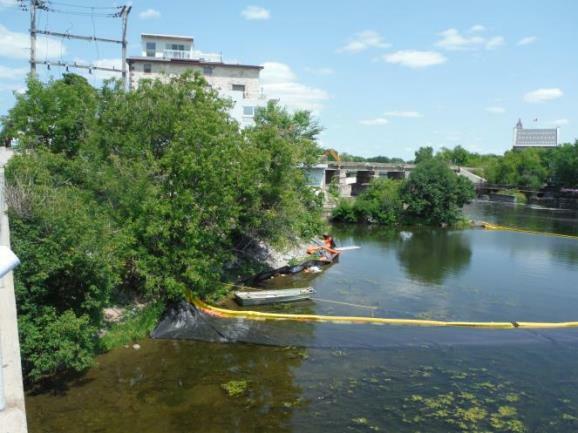 Before the water is completely pumped out various methods are used to remove fish and other wildlife (seine netting, minnow traps, backpack electrofishing and dip nets). As the water lowers more of the animals are removed with dip nets or by hand. The salvage operation focuses on fish, turtles, frogs, salamanders, and native freshwater mussels but also other organisms such as crayfish and aquatic insects. These are all released in the river, outside of the work area. Once the salvage is completed, then measures are put in place to keep fish out of the area. This is mostly done with the cofferdam or rock check dams. Since reptiles might decide to enter overland, daily visual sweeps of the work site are done in the morning, before the construction equipment starts driving around, to see if reptiles have walked into the site. 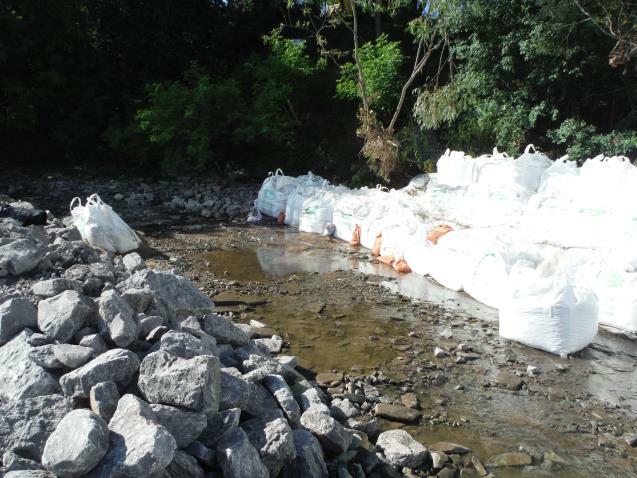 Photo 2 – Water and aquatic fauna removed from area upstream of the powerhouse. 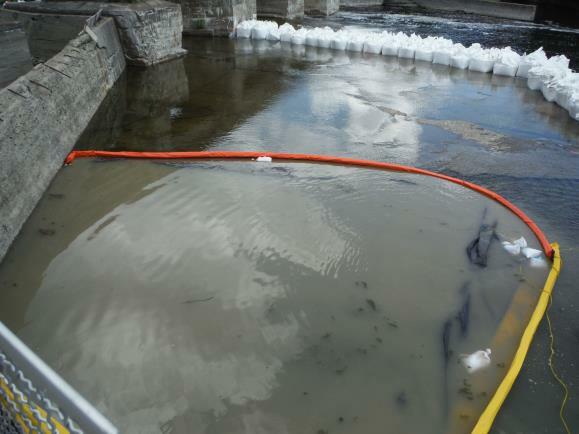 Photo 3 – Water removed from between the access road and the upstream cofferdam. Photo 4 – The turbidity curtain downstream of the tailrace. In most instances cofferdams leak. This leakage water is usually clear. Direct the leakage water around the work area and preferably out of the isolated area. One technique is to create a path or trench around the site. This is been implemented by hoe-ramming some of the area that was already slated to removal. Photo 5 – The turbidity curtain downstream of the tailrace. 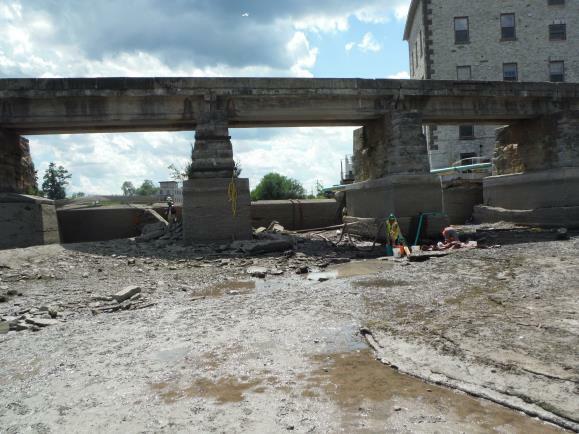 At the same time as the salvage and dewatering were occurring below the main upstream cofferdam, the construction of more cofferdams continues along the side of the weirs. Later on another will be placed on the downstream side of the tailrace along with an access road. The location of the cofferdams is based on the site’s bathymetry and the timing and location of the different work activities. The large upstream cofferdam isolates the area that will become the intake. The ones being installed on the bedrock shelf, parallel to the river flow, will isolate the area for the weir removal and construction of the new ones (Photos 5 and 6). Soon there will be another cofferdam installed this one at the downstream end of the new tailrace. It will be placed inside of the turbidity curtain that was installed recently (see Photo 4 above). The same methods and mitigation measures as those employed during Steps 1 and 2 will continue. As in Step 1, there is a potential for turbidity especially during the construction of the access road. 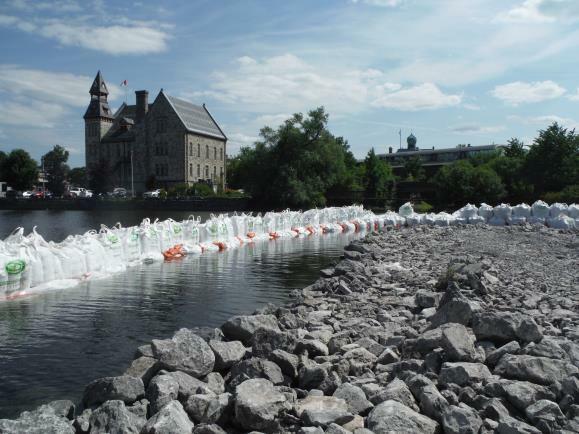 You may see new turbidity curtains being deployed and the placement of rock will be completed slowly to help reduce the suspension of sediments. 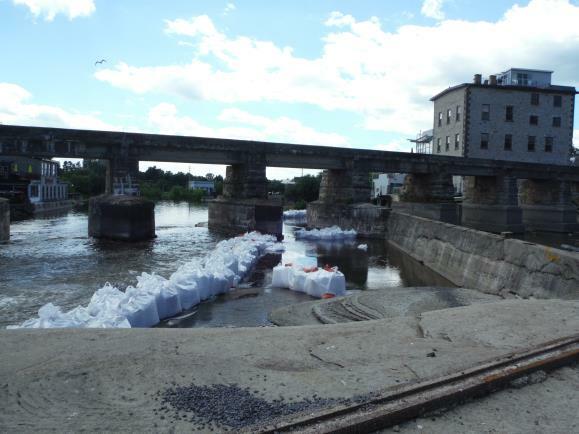 Photo 6 – Building of cofferdam alongside of the weir to be replaced. The same measures as those put in place during Step 1 will remain. Principally, the monitoring of water clarity upstream, downstream and in the work area and the maintenance and adjustment of sediment and erosion control measures and equipment. The removal of fish and other organisms will continue in these newly isolated areas.